Fabian Delph's Manchester City debut ended after 18 minutes on Friday as he suffered a suspected hamstring injury in a 4-1 defeat by Real Madrid. The £8m signing from Aston Villa started on the left of midfield as Real lifted the International Champions Cup in Melbourne. Goals from Karim Benzema, Cristiano Ronaldo and Pepe gave Real a 3-0 lead. Yaya Toure pulled a goal back from the penalty spot before Denis Cheryshev scored for the dominant Spaniards. 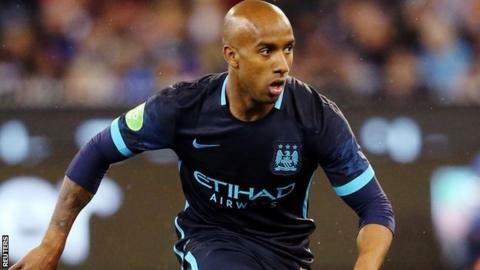 Delph, 25, signed a five-year contract at City less than a week after saying he was staying at Villa Park. Watched by a near-capacity 99,000 crowd at the Melbourne Cricket Ground, he had limited opportunity to make an impact before going down holding his left hamstring and being replaced by Jesus Navas. "Unfortunately, it looks like Fabian has a problem with his hamstring - we thought it would be useful for him to play 45 minutes but he got the injury so it's not the best news," said Pellegrini. "We will have a more clear diagnosis from the doctor on Saturday." Delph had started behind lone striker Raheem Sterling who, having scored three minutes into his City debut as they drew 2-2 with Roma before winning on penalties on Tuesday, was again jeered by sections of the crowd. Sterling became the most expensive English player when he made the £49m move from Liverpool and, on the rare occasions City attacked, he looked a threat. It was the England forward who earned City a route back into the match, after they had gone 3-0 behind within 44 minutes. His control caused Sergio Ramos to concede a penalty for handball, although the offence appeared to be outside the area. Toure converted the spot-kick but it did little to disguise the 10-time European champions' superiority. Real Madrid boss Rafael Benitez fielded a strong side which included Ronaldo, Gareth Bale and Manchester United target Ramos. They impressed against a City side containing 16-year-old debutant Cameron Humphreys and 20-year-old Jason Denayer in central defence, while former Fulham teenager Patrick Roberts appeared as a second-half substitute. Benzema hooked an 18-yard volley into the net before Ronaldo raced through City's defence to prod the ball past goalkeeper Joe Hart within 25 minutes. It got worse for Manuel Pellegrini, as an unmarked Pepe powered in a header and, following Toure's penalty, Cheryshev stabbed in after the break. "We knew before the game that it was difficult to play against a team with such good attackers without Eliaquim Mangala, Vincent Kompany and Martin Demichelis," Pellegrini said. "You must also add the other players who are not here: Wilfried Bony, Sergio Aguero, Fernandinho and Pablo Zabaleta. "I'm not concerned as we had a lot of missing players and then a lot of players have also arrived late, so they've worked just five days. "For them, they're just starting work - it's important in pre-season to work hard and it's good to play against important teams but you can't be worried about winning or losing at this point."